It doesn’t seem like that long ago when the number of administrators (and educators for that matter) sharing their stories online was scarce. Aside from the excitement of seeing our numbers grow over the last couple of years, I continue to be energized by the potential we have to improve our schools as increasing numbers of educators share what is happening in their classrooms, schools, and communities. Allowing others to see concrete examples of progressive ideas being implemented successfully gives others the confidence that they are not out on a limb by themselves when they consider taking similar risks. While I am grateful to be part of a community of educators that pushes my thinking daily, there is a group out there that influences me even more, our students. 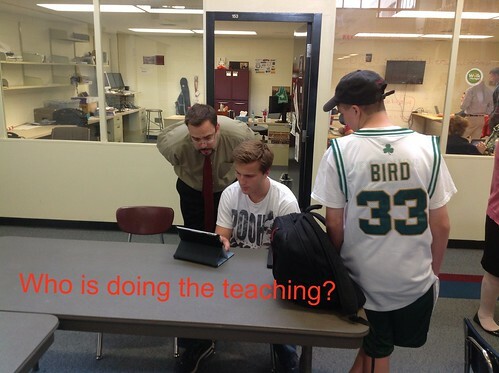 In fact, I’ll tell you that the question on the picture above (Who is doing the teaching?) is really a trick question. The real question that we need to ask ourselves is who is doing the learning? Or better yet, as individuals, we need to consider whether we are continuous learners ourselves. Personally, I am constantly looking at my own daily routine and thinking about whether or not I am practicing what I preach. Am I spending too much reading, blogging, tweeting, etc? Am I just consuming details about the efforts of others? What am I contributing myself? The moments that tend to impact me most are opportunities to learn with others (in-person). I feel fortunate to be in a district where there are formal and informal opportunities to learn with and from both students and staff. In looking ahead to 2013, I hope to see the line between teachers and learners continue to blur in our schools. I hope to see more public examples of this to share within and beyond our school community. Here are a few of my favorites from 2012! #3 Learning Every Day in Burlington – Features a daily post from a learner in our school community.